Ramen tastes even more amazing than usual (cold weather, hot bowl of noodle, go figure). Tsukiji Fish Market in the Winter time is a FIESTA! (Fish fatten up in the winter time so it’s one of the best time of the year to get sushi and sashimi). Plus, with the traditional marketplace moving sometime in 2016, another reason to go visit now. While I adore my previous summers in Japan, which were filled with cold soba noodles and sweet kakigori in the sweltering summer heat, I love wintery Japan. It is the perfect season for warm comfort food. I’m looking at you ramen, oden, and fried-everything. Plus, this time around, winter fashion was in full swing and Japanese girls really rock the furry coats and beanie look–some great food fashion for thought! Below, you’ll find a round-up of the foods I chomped on and places I visited during my recent January 2016 trip. I’ll be introducing some of my favorite eats around Tokyo, as well as particularly delicious cold-weather-eats! Thank you to all that ate with me and showed me amazing restaurants, ありがとうございます. This is Part I of my Tokyo Eats Winter Guide–I’ll have Part II coming soon! Omotesando just a couple days after New Years, which coincides with Hatsumode, the first Shinto shrine visit of the year in Japan. Omotesando Hills–the large indoor shopping center designed by famous architect Tadao Ando. Walk down Omotesando and you’ll see the Tokyu Plaza Omohara building–a giant futuristic building designed by Hiroshi Nakamura. Above the Omohara is a little oasis–great place for coffee with a view in the winter time. Don’t be fooled, this gorgeous and serene rooftop is a beer garden in the summer time! Bill Granger whips up phenomenal honey ricotta hotcakes. Pair it with an Australian Breakfast platter, you have yourself a breakfast some celebrities call ‘the best in the world.’ The line for Bills can be ridiculously long, so go early (or late! I’ve had breakfast for dinner before). Top of the Tokyu Omohara is the home of Bill Granger’s breakfast powerhouse, Bills. For example, Bills’ silky and creamy scrambled eggs are not to be missed. And here’s the wildly popular honey ricotta pancakes that get Tokyo pancake lovers waiting in line for HOURS! Take the JR Yamanote Line to Harajuku station–do some shopping down the insanely packed Takeshita Dori. This is where the colorful fashion of Harajuku really displays itself! Walk further up Harajuku for around 5 minutes (0.3 miles), you’ll be right next to Meiji-jingu Shrine. Worth a visit, and if you go in the New Years time, hatsumode (the first shrine visit of the year) is not to be missed. Yoyogi Park is right next door–great for runs and general gatherings. If you’re lucky, you might even spot famed Japanese author Haruki Murakami here! Now go past Meiji-jingu mae and head up Omotesando–the glitzy equivalent of NYC’s 5th Avenue. Do you appreciate gorgeous brand-name stores? Not only is this Tokyo’s hub for high fashion, brand-name architects have created masterpieces here. Read about New York Times’ great feature on it here. Tokyu Omohara Plaza, the futuristic building you see at the beginning of Omotesando is worth a visit! Head up to the top where there’s an outdoor patio with great views. Bill Granger has his Tokyo outpost here–his restaurant Bills is known to have insanely long lines! But honestly, the scrambled eggs and honey ricotta pancakes are worth the wait! When you’re done with shopping, check out the Aoyama area which is further down Omotesando. There are a bunch of cafes and small boutique shops to browse through as well! Check out Tamawarai if you’re hungry, a great one Michelin soba restaurant around this area. Tsukiji Outer Market–even if you don’t venture inside the fish maket for the tuna auction, the outer marketplace has plenty of stalls and vendors. A fantastic way to savor the market without waking up at 3am. Onigiri–handmade riceballs wrapped with different fillings. For under 2 dollars, you can grab a quick snack on the go. Bright yellow and delicious tamagoyaki–sweet slices of Japanese omelet. I love eating these as I wander around the market! I was SO tempted to have a bite of this. This warmly dressed cook wedged small pieces of butter onto the fresh scallops and then proceeded to torch them until all the scallops were sizzling in oil. Seriously, this was unreal! Sushizanmai is one of my favorite go-to’s in Tsukiji Fish Market. You don’t have to wait for hours to eat sushi (I’m looking at you Sushi Dai ) but it is arguably one of the best sushi-ya around. Its quality of fish and service is consistently fantastic, making it a definite must-go. Sushizanmai–while it is a chain, its quality of fish and service is consistently fantastic. At 9am, the sushi restaurant is already hustling and bustling with people and shouts of Japanese between the chefs. I find it absolutely brilliant that Japanese salaryman come to Tsukiji for some breakfast sushi… and pints of beer. I think that’s a GREAT way to start the day. Special omakase set–look at those gorgeous pieces of uni and ikura! My favorite part of sushizanmai? Their fresh miso soup (generous serving size as well! ); unlimited of course. DRINK UP. My friend Daniel ordered the tuna omakase–gorgeous shades of pink and red everywhere. Can you tell which is the ootoro? The anago nigiri (salt water eel) on the far right was delicious. Okay, so even after a whole sushi omakase, my friend Daniel and I still had our eyes set on the other prize: 中華そば 井上 Inoue, possibly the best soy-based ramen stand in Tokyo. It’s on the outer perimeter of the market; once you find a line of people waiting to eat ramen standing up you’ve got the right one. Inoue–yes, the line was ridiculously long. And yes, we waited in it. Whipping up bowls of ramen in sets of 8–the five minutes you get as you stand up there watching the bowls of ramen noodles being served are just amazing. How to eat? Standing of course. There are a couple tables next to the ramen shop–if you can’t slurp while others stare you down in hopes of getting your spot afterwards, then you might run into some trouble at Inoue. But trust me, this is well worth the hassle. TA-DAA. The final masterpiece. Beautiful. GO GET SUSHI. Sushi Dai, Sushi Daiwa, Sushizanmai (where I went this time), etc. Anywhere, and I promise you, always fresh. Get the omakase, which is the chef’s choice, and prepare for a sushi feast. Share a piping hot bowl of shoyu-ramen at the amazing 中華そば 井上 Inoue. You won’t regret it–the salty and flavorful soup is wonderfully warm and filling. The perfect winter breakfast, lunch, or dinner. Wander around the market and grab some snacks to go. Tamagoyaki, fried oysters, rice balls, pickles, you name it they have it! Want traditional chopsticks or bowls? Go kitchenware shopping. Tsukiji might not be Kappabashi, the Kitchen Town of Tokyo, but it is still a popular place for some kitchenware shopping, especially if you’re on the hunt for some good deals. Simple chopsticks, bowls, and sushi-making essentials can all be found here if you look hard enough! The iconic Ginza Wako department store at the beginning of Ginza’s main shopping avenue. The clock tower on top was designed by Seiko, renowned Japanese watch and clock maker. Ginza’s main street turns into a pedestrian-only avenue on weekends–I took this photo last summer when I was in Tokyo. Kimuraya Bakery — The Original Anpan (sweet red azuki bean stuffed bread) Bakery! Right by the Ginza station is Kimuraya Bakery, the birthplace of Anpan. This beloved Japanese bread stuffed with sweet red azuki bean paste can be found in all convenient stores and pan-ya (bakeries). But don’t miss the ones at Kimuraya because the heritage of their Anpan is unrivaled! Walking down Ginza’s main shopping district you might smell something delicious. Kimuraya Bakery is a must-visit if you’re in the area–where else can you find original Anpan? Sakura Anpan–with salted cherry blossoms in them, this was made in honor Emperor Meiji. Apart from phenomenal Japanese cuisine, Tokyo boasts just about all my favorite world-class restaurants and patisseries as well. For example, Angelina is a Paris-based tearoom that has a Tokyo location in Ginza. If you are a sweet tooth, you’ll adore Angelina’s trademark Mont-Blanc. Mont-Blanc — meringue, cream, and chestnut paste, what’s not to love? A trio of ice cream and sorbet. English menu for the January five-course dinner. Moreover, because it was New Years, they served special porridges and mochi in celebration of it! Special New Years dish–with a savory chunk of mochi in there for good luck. Bamboo shoots and stuffed tofu in a light kelp broth. A trio of seasonal specials–up front is the sweet egg custard with gold-dusted black beans. Fried crab croquette–piping hot and absolutely fresh out of the frier. My favorite type of winter food! Sashimi–look at that piece of gorgeous tuna! Ikura over a bed of hot rice, served with pickled plums and miso soup. The hot-stone rice that we couldn’t finish was packed up at the end of the meal for us, and wrapped into cute little onigiri rice balls! A thoughtful touch. Take a walk down Ginza’s main shopping avenue, and visit one of the large department stores (Wako, Mitsukoshi, etc.). If high-end fashion is not your cup of tea, head downstairs to the basement where you’ll find just about the best depa-chika (literally means basement of department stores). They have amazing food selections that put food courts in all other countries to shame! Take an afternoon tea/dessert break. Whether it’s Kimuraya Bakery’s original Anpan, or Angelina’s Mont-Blanc, spare an hour or two for some tea-drinking and people-watching in Ginza. Heard of Jiro Dreams of Sushi? Go take a picture in front of the storefront, or better yet, dine there! 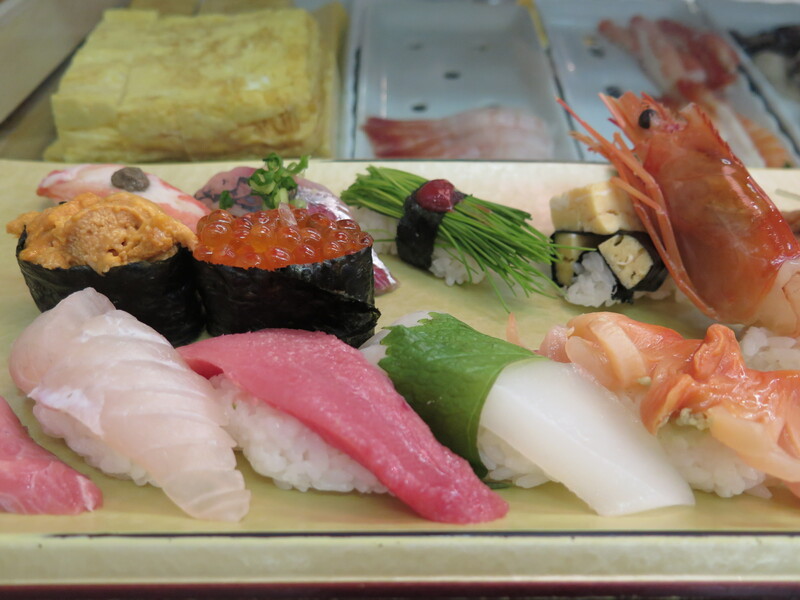 The subject of the famous documentary, Sukiyabashi Jiro is located in the Ginza station. You can seek out its humble storefront and take a quick picture. Or, if you make a reservation three months in advance, have a three Michelin Stars dining experience! Treat yourself to a traditional Japanese dinner in Ginza, where world-class fashion and dining merge into one. Maru, the restaurant I introduced above, is a great place to try affordable kaiseki if you want. Otherwise, I adore Kakiyasu, a great sukiyaki restaurant that serves phenomenal A5 beef. Visiting Tokyo? Have a question? Send them my way! Thanks for reading Part I of my recent Tokyo food adventure. I’ll be back with Part II soon! I agree that winter is the best season to visit Japan for foodie. Now every meals here in Tokyo is delicious and enjoyable. Tokyo is delicious all year round 🙂 Thank you for reading! I think we should exchange notes. Love your posts on Tokyo. We are going back this October. That’s great. Love that old world charm you won’t get at the new market. Will certainly hit you with questions! Love this list!! Ginza Maru is my favorite too, food there is so tasty and you cannot beat the price!